Unusual characteristics associated with the rain event that caused the 2013 flood triggered the rivers to behave differently than what is typically observed in Colorado floods, leading to massive erosion that reshaped and redirected stream channels and also catastrophic failure of debris dams that exacerbated peak discharges. Unlike previous known flash floods in Colorado where a river peak-stage depth can rise over a matter of minutes as in the Big Thompson Canyon flood in 1976, the 2013 flood caused creeks to rise more slowly, simultaneously and stay at peak levels for several hours. This behavior caused massive debris transport and damage, but also allowed for emergency responders to get people up and out of the way and save many lives. 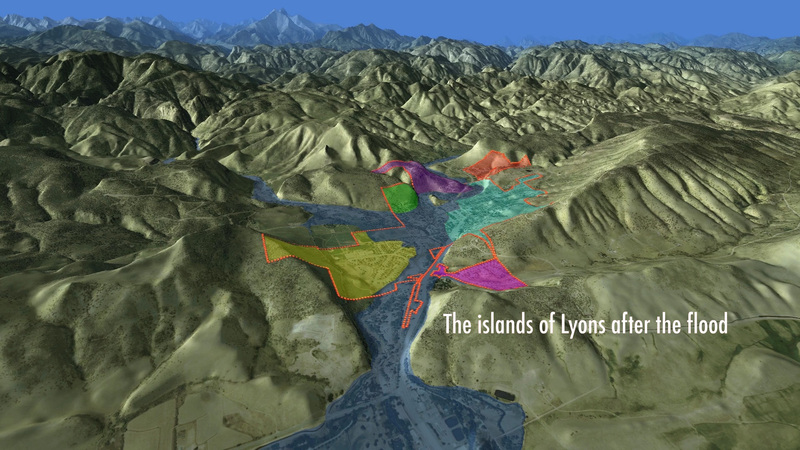 Although the rain event was rare, the flood event along the Saint Vrain River, though significant, was not as uncommon, with about a 500-year recurrence interval measured in Lyons. The peak flow of the Saint Vrain River in Lyons during the flood has been estimated at over 23,000 cfs (cubic feet per second): a flow-rate nearly 100 times its average of 250 cfs at this time of year (September).